Today was my 3rd attempt at this distance with my new Ruger precision rifle in 6.5 creedmoor. I'm still learning and improving my shooting skills. Groups were pretty good (for me), the biggest spread was 2.1" and the best group was .930". All were 5 shot groups with my reloads. Also had two center mass hits on steel at 500 yards. My first attempt at 300 yds... BULLSEYE! Subsequent shots didn't seem to be making the hole bigger. "Wow", I thought...this is going to be some group to tell the guys about. All in the same hole! Walk down to the target and discover that I only hit the target once...the scope had come loose and remaining shots all went into the berm. I've had that happen. First thing I check now when setting up , make sure everything is tight. How much did it cost to shoot..are you a member there..What was it like...covered shooting sites or out in the open? I visited once years ago while they were still building the long range and never saw it completed. I've heard mixed reviews about the new owners. I've shot 600 yards at Port Malabar and it was a very good experience. Homestead is a very nice set up. Most of the various ranges have cover. Stands and cardboard readily available. I am a member, I think the annual fee is $150 if you belong to the local IDPA club (I do), $225 if not. Safely officers are pretty cool. I've shot IDPA there many times and have used the 50 and 100 yard ranges a lot too. Each shooting session is $15 for members. I believe the 200-500 yards range is for members only. My neighbor and I shoot there at least twice a month and find the membership worth the price. I got a Ruger Precision Rifle in 6.5CM last Christmas. I've been working on my precision skills for a couple of years on and off (mostly off) with a custom-built precision AR-15. I had taken the AR-15 up to 600 yards. Now with the 6.5CM, I can stretch it out more. A couple of weeks ago, I rang some steel at 1,000 yards with the RPR 6.5. One thing I've realized is that most rifles are capable of better precision (groups) than the shooter (me). Here's my best group from last Sunday at 200 yards. I knew I pulled the shot at the bottom, so I excluded it from the group analysis. So, four rounds in a 0.355-MOA group! The Ruger Precision Rifle is a quite capable precision shooter at a relative budget price, if you "do your part." That's the trick! Doing your part CONSISTENTLY. It's not easy and is a perpetual pursuit. That's what makes it fun! BTW... regarding the notation of "Magnetospeed attached".... It was attached to the handguard (using an MK Machining picatinny mount), not the barrel. 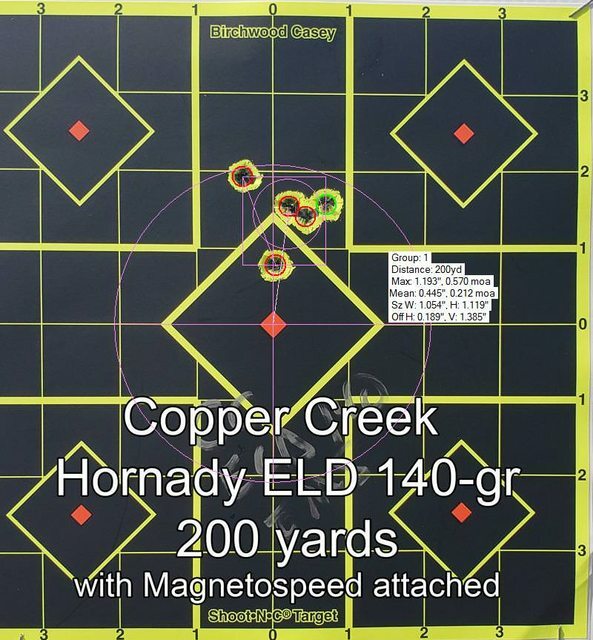 Yeah.... in my Ruger Precision, the Hornady 140-gr ELD-M seems to be the best factory ammo. Federal Gold Medal Berger 130-gr is pretty good, as is Prime 130-gr Match. But, ELD-M is the best so far. 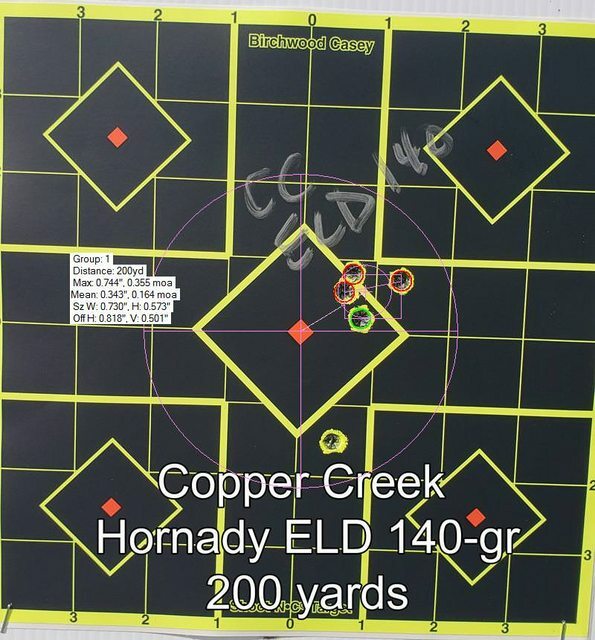 Now, I'm using Copper Creek to do custom loads for me. It's like delegating the job of custom loading. Pretty neat service. 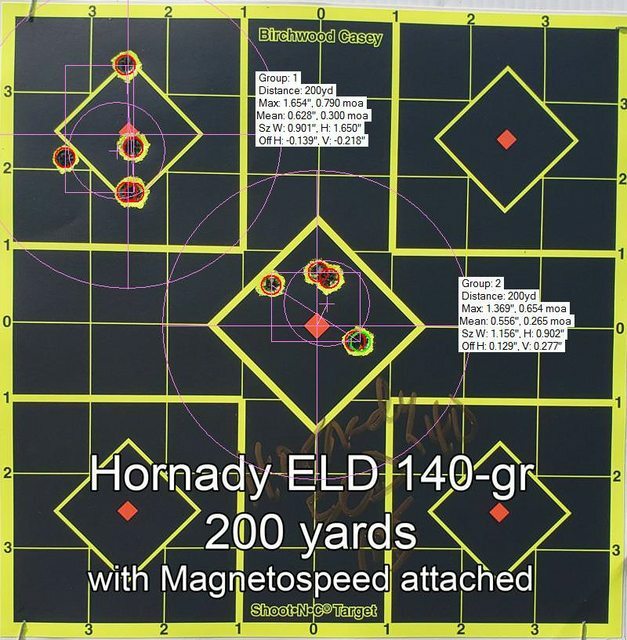 My Bergara likes the Hornady eld match 140gr as well. It also liked Federal American Eagle 140gr open tip match. Actually the federal has been my best group at 200yds at 1.263”.